She felt like a god in a shrine. The room was nice and dark and through the open door they could see the bar. The noises from there seemed to come from far. Yes they were like gods in a shrine, living a life of their own and only noticing the so called real world from a distance through a veil. And the drinks they were having seemed like oblations to keep them happy given from the people outside. She took a sip from her drink in which a big ice ball was floating and making clanging sounds. The glass had ornamental cuts and she liked to follow their shape with her finger. They sat next to each other on the bed facing the open door to the bar and she felt reminded of home, where they were facing the TV when lying on the bed. They had read some stories from the book on the table and she wondered how their own love- story would be going on. A Love Hotel is a space for lovers who want to satisfy their desire and to be alone. Japanese people are quite familiar with the idea of a love hotel, but for foreign people it seems a very exotic concept. A space that is prepared for the quite limited aim of making love. A system that makes it possible to check in and out without being seen by anyone. An interior and tools that magnify the pleasure. No other countries except Japan have these love hotels that specialize in this one purpose and in stimulating one's imagination. Steffi Jungling, a German female artist, creating installation works with the motif of literature, is one who is inspired by the Love Hotel. She will start an art project, room4love, on the stage of a real love hotel, website and art gallery. Sunflower, a love hotel in Asakusa, Tokyo will join this project. This hotel has a 20 year history and has a unique character such as a variety of room interiors, advertising by the Internet and so on. It invites a diverse clientele, from local people to foreign travelers. This hotel has thirty-nine rooms and Steffi will display a message in each room. The content of the message is a short love story written in the motif of "Fragments d'un discours amoureux" ("Fragments of a language of love") by the French philosopher and writer, Roland Barthes. When lovers enter a room, they will meet the fragment of a love story, created by Steffis imagination. 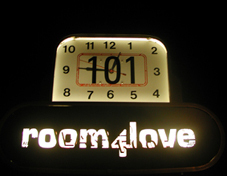 In addition to this real hotel, a website room4love.com will make thirty-nine rooms. Each room will display the same message as the real room and a panoramic photograph of its unoccupied interior. The visitors in the real room can get the message, access the website and send their own message such as their own stories in the room or their own love experience. Of course, visitors to the website can send their message, even though he/she does not go to the real love hotel. Steffi will write new stories based on the messages by visitors, or put their own stories as they are. So, in the room of the website, countless numbers of love stories will be created. One more gate to this love hotel will appear at Gallery ef, an art space in Asakusa. This building was built in the Edo period, 136 years ago. Steffi will create an installation, room4love. During regular opening hours, 11:00 to 19:00, the audience will be able to see this room without charge, and after 19:00, visitors can stay just by themselves for a charge of 1,000 yen per hour per person. It is possible to order drinks from the bar. It takes ten minutes walking from the imaginary room to the real hotel room of SunFlower.